Winter is well and truly upon us here in the Land Down Under! Which, roughly translated for our outside-of-Aus friends, means that when it rains, it rains constantly. Con-stant-ly. For those of us with young kids, this can potentially spell disaster. Unless you have pumpkins. Naturally. 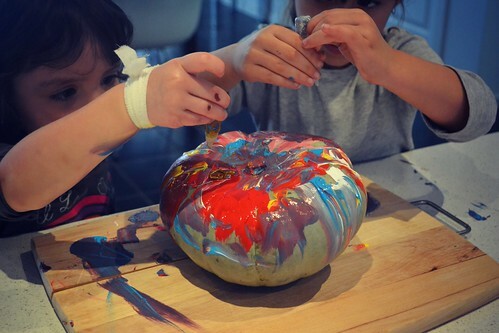 Take two pumpkins (ours were a Butternut and a Windsor) add two curious kids, and you have a wonderful low-cost, hands-on, screen-free indoor activity. The girls LOVED it! 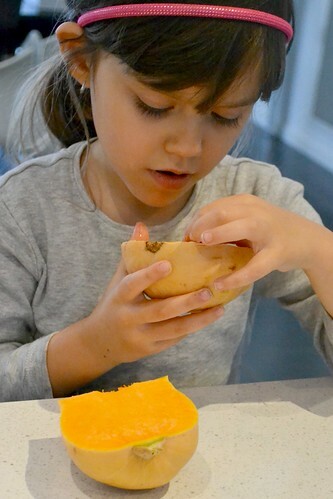 In fact, they loved it so much, I kept trying to find ways to extend the experience for them. 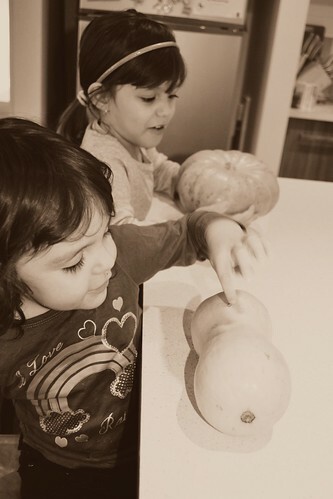 We began by feeling the pumpkins, talking about how they felt using words like "rough", "smooth", "bumpy" and "heavy"; fairly basic language for Eden (4) but great vocab-extenders for Ava (2). 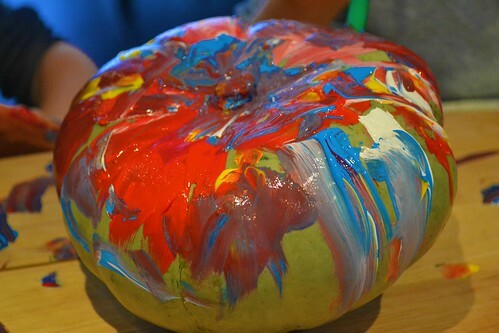 The girls then painted the Windsor pumpkin and added some tubes of glitter glue to make it as 'magical' as they could. I think it looks pretty darn good! 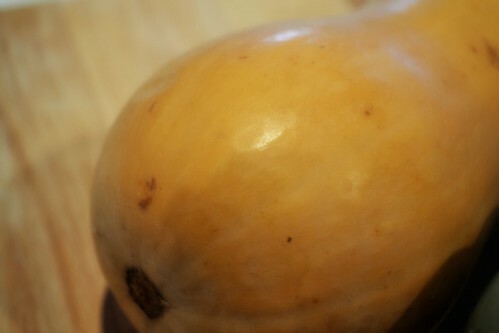 As we set aside the now-beautiful Windsor pumpkin to dry, I halved, then quartered the Butternut pumpkin and gave two segments to each of the girls. 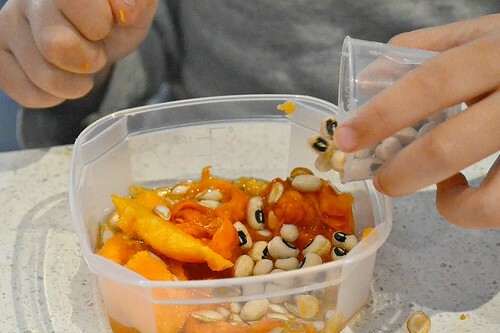 They felt them, poked and prodded them, licked them (Ava did anyway) and started scraping the seeds and pulp out with spoons. At this point I began looking for ways to extend their exploration time, so I supplied them with little cups of water, black-eye and lima beans, and some herbs and spices that I haven't touched since I got married ... over six years ago. Ahem. 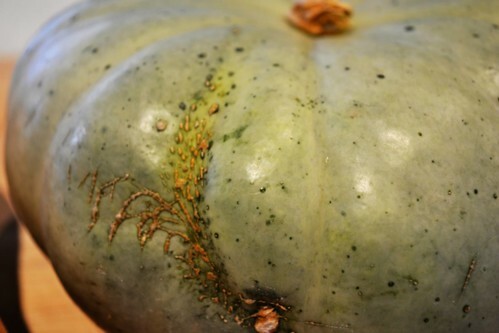 They set to work, busily mushing pumpkin pulp with paprika, spooning the mush into the hollowed out part of the pumpkin, stirring it all together with water. 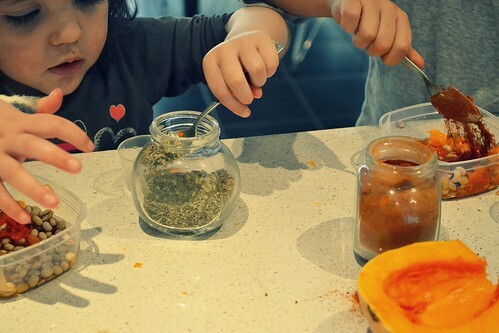 We decided that their creations were magic potions, and decanted them into old baby food jars. 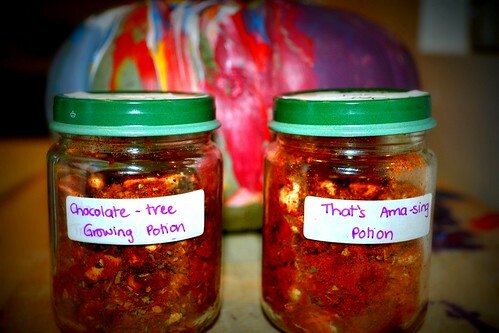 Eden dubbed hers a "Chocolate-Tree Growing Potion" - she is SO my daughter! - and when I asked Ava what she wanted to call hers, she said "That's amay-sing! (That's amazing! )", and that's what we called it! 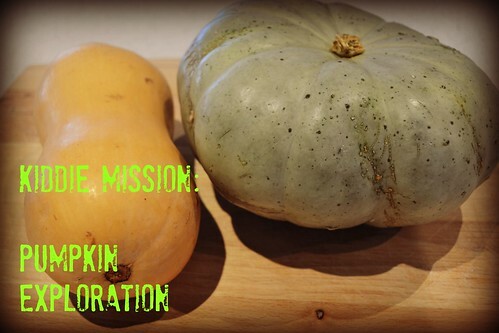 All told, this pumpkin exploration play session lasted the better part of TWO HOURS! 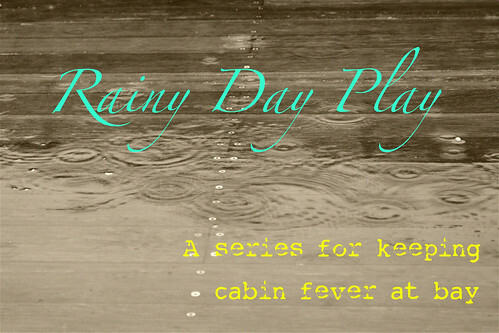 A two hour boredom buster on a rainy day? That's a winner in my book.